The Deluxe Combo Loom Kit has 3 columns of 13 pegs tied together with 4 base units to create a cluster of 39 pegs. Additional looms can be combined either end-to-end, or side-by-side to create a larger work area. The kit comes with the Loom, 2 Loom Tools, 600 Rainbow Bands, 200 Tie dye Bands, 200 Glitter Bands, 200 Glow Bands, 50 "S"-Clips and 6 Charms. 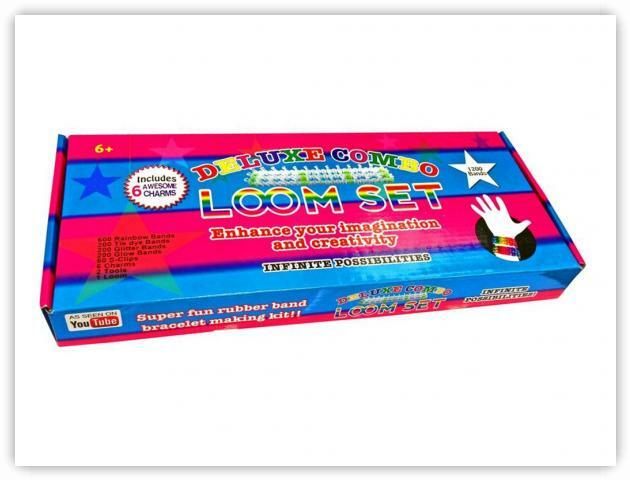 The Deluxe Combo Loom Kit can be purchased at Wal-Mart.